"A superb app! A great buy if you need a photo editor to replace Aperture", Ian Evenden, MacFormat. 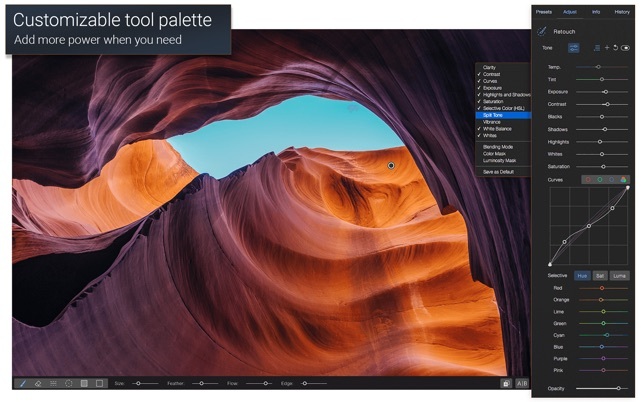 Wish you could enhance your photos with pro-level tools, make precise local adjustments, retouch portraits, add filters, watermarks and more, all in an easy-to-use and beautifully designed app? Download Picktorial! 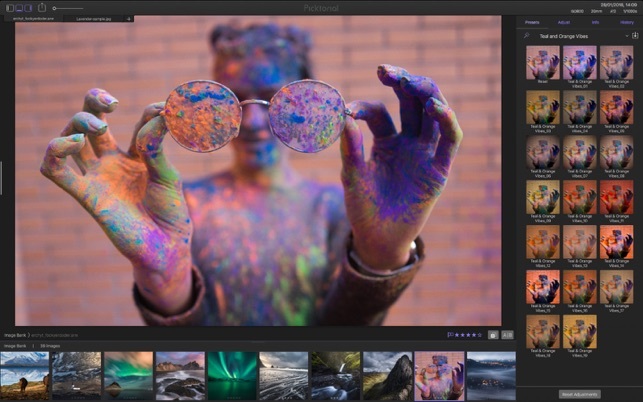 Picktorial integrates with macOS Photos, so you can enjoy the power of Picktorial right from Photos. 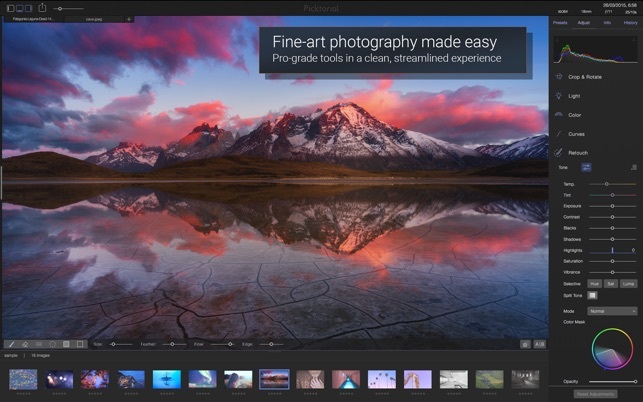 Or, you can keep using Picktorial to organize your photos without the time-consuming import process of other apps. 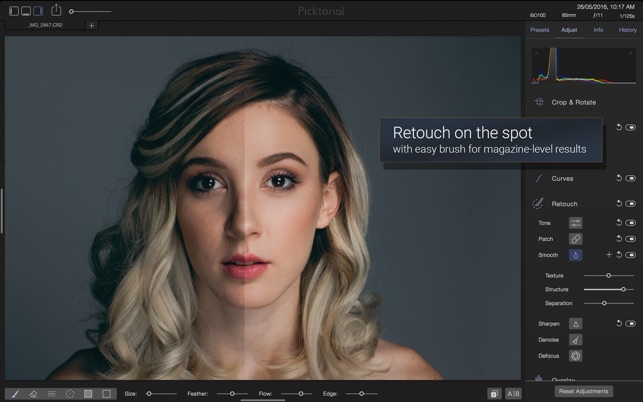 You can refine your edits at any time, without undoing later edits - whether you are using Picktorial as a Photos Extension or as a standalone app - and even after closing and reopening the app. 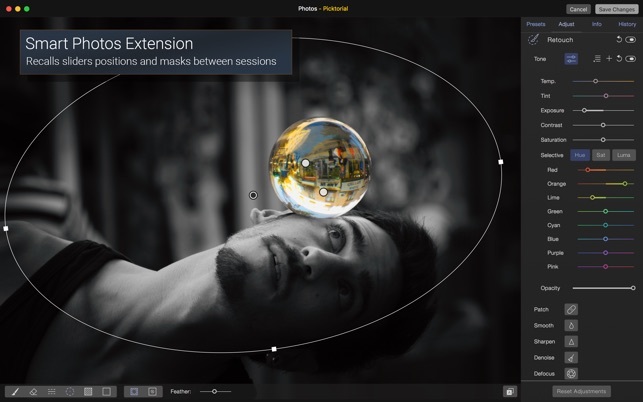 Picktorial provides a rich array of tools, all of which operate in a fully non-destructive manner and with live preview. • Copy-paste adjustments and masks between photos. • Batch editing of adjustments and metadata (premium version only). • Easy import and export - automatic folder content monitoring and no cataloging. 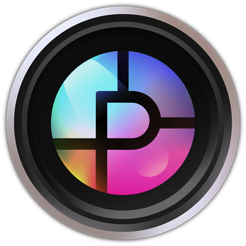 Picktorial takes full advantage of the latest Mac features and technologies like Cocoa, Metal, OpenCL, OpenGL, Core Image, Grand Central Dispatch, Retina display, Auto-save, Time Machine and much more! - You can subscribe for unlimited access to premium features offered within Picktorial - including updates for future premium features. - You can can also get unlimited access to all features that are currently available at one-time payment (this is not a subscription), but future features may be sold separately. - Subscriptions auto-renew at the cost of the chosen package, unless cancelled 24-hours in advance prior to the end of the current period. The subscription fee is charged to your iTunes account at confirmation of purchase. You may manage your subscription and turn off auto renewal by going to your Account Settings after purchase. • Supported resolution: up to 100MP or 16384px at longest dimension. Major new update! 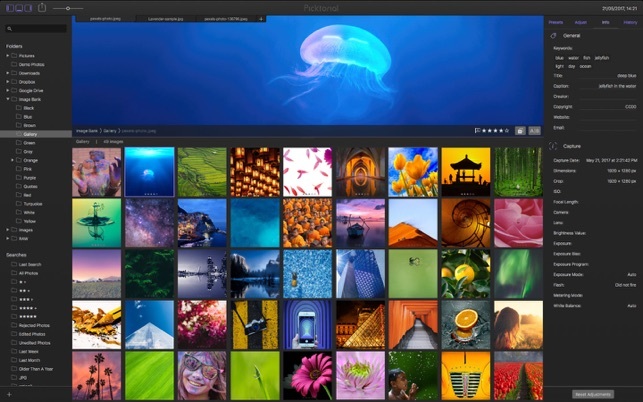 Enhanced photo management and advanced precise editing - now FREE FOR EVERYONE! I have been in the photo industry a long time. At the age of 74 I thought I had reached a point of not being impressed anymore. Welllll, I am impressed. 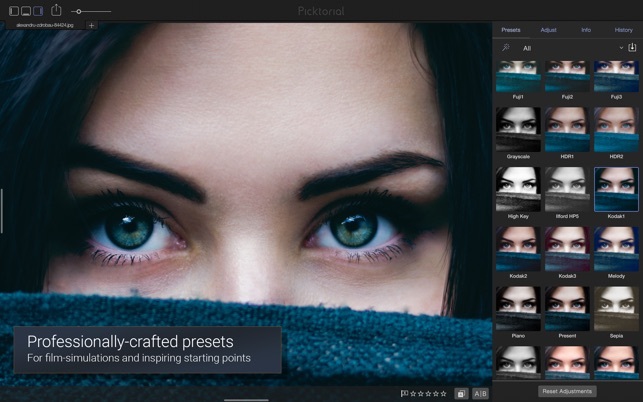 Picktorial has proven to be one of the easiest, simpliest, and highly creative software I have used in years. The level of adjustments from universal for the whole image to local for the most minute parts of the image are extensive and accurate and easy to use. The colors are superb in my raw files for my Fuji X cameras and lenses and let me tell you that is hard to find in any software today. The brushes, gradients, healing capabilities are just outstanding and this is the only program I have found that allows local adjustments for everything you can do in universal adjustments. I love the ability to sharpen just specfic areas or apply noise reduction to other small areas like the sky if necessary. And to control luminosity and color and saturation just to specific regions is the best I have ever used. What have I used? Here is a list. Adobe Lightroom, On1 Photo Raw, Alien Skin x2 layers, Luminar (terrible) Aurora, Nik plug ins, Macphun Plugins, Affinity. I have worked with all of them and nothing compares. And for the price. Oh my goodness. You just cannot beat this. I have probably underrated this app having not used it,to its full potential on my first day of usage. It appears to be an app for a quick adjustment. 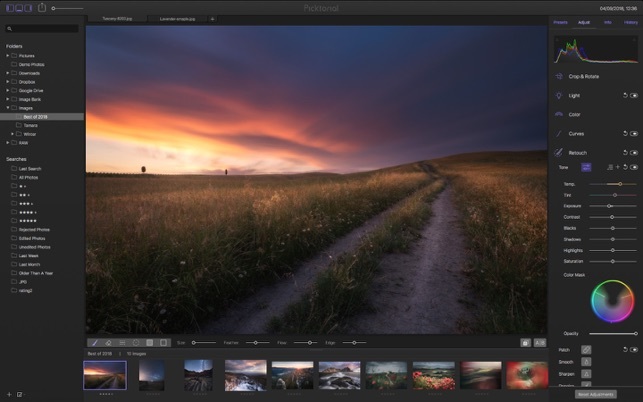 It does have some features that I like although, I would not trade the app over other popular Post processing tools as LightRoom, Luminar, Aurora HDR 2017, or Photoshop. If you are a beginner this certainly is an app which you will find beneficial. The app appears to be generic in nature but it has a good feel to it. Again, I would highly recommend this app if you are novice or a beginner. If you are just learning how to use photo editing tools, this app definitely would be a good beginning point. I look forward to seeing future updates and what the future may hold. It most definitely has great potential. Just stumbled onto this gem of a graphics program that works non-destructively with RAW files, sports comprehensive and easy-to-use features and a modern interface, offers tutorials for some of its intricacies, supports camera profiles, provides snappy tech support and is available just now at an amazing price. A demo is available on their website. If you shoot in RAW, you’ll want to look at this! © 2016-2019 Picktorial Innovations Ltd.